The parties had a private meeting with the Judge the day before the bail hearing that was closed to the media, at which George's clothing and more importantly, witness logistics, were discussed. So the attorney representing the state at the hearing, Bernie De La Rionda, knew that he would have an opportunity to cross-examine George Zimmerman's wife, father and mother. LESTER: It was purely for logistical purposes to figure out how to get Mr. Zimmerman dressed for the hearing and how to secure the appearance of the witnesses in a manner which preserves their safety. The state's attorney is, according to statements by Angela Corey, one of her top homicide prosecutors. He's obviously familiar with the state's burden at a hearing on whether bail should be granted in a case in which capital murder or a life felony is charged. I explained the burden at length, with citations, here. In order for bond to be denied, the state must establish more proof of guilt than that required for a jury to find beyond a reasonable doubt that Zimmerman committed second degree murder. We feel that we've established at least probable cause if not more based on the facts. What it boils down to, he shot somebody. Since probable cause is not the test at a bond hearing on life charges in Florida, and an Affidavit for Arrest warrant does not suffice as evidence a crime was committed, and the prosecutor obviously knows this, it seems he chose to concede the detention issue (without saying so directly) and instead limit his arguments to flight and dangerousness, perhaps in hope of having bond set high enough to be out of Zimmerman's reach, which would have the same effect as an order of no bond. While he threw out the figure "$1 million," he gave no reason why that amount was reasonable under the circumstances. It didn't even seem like a serious request. Most likely, the prosecutor figured the state would lose the no bond issue given its high burden, and decided it was better to not present evidence at all, keeping its cards close to its vest. Only, it didn't work out that way. O'MARA: Did you bring any supporting documentation with you to the courtroom on his bond motion at all? The prosecutor seemed completely unprepared for his cross-examination of the investigator. What stood out to me was the number of disclosures that suggest the state's evidence is speculative, at best, and the degree to which the state's attorney participated in the preparation of the affidavit. The investigator testified he was not the one who chose the misleading, inaccurate, emotion-charged words and phrases in the affidavit, and the only others involved were his fellow investigator and "Bernie." The prosecutor's name is Bernie de La Rionda. First he described the affidavit as a collaborative effort between the two investigators and their supervisor (who appears from later statements to be prosecutor de La Rionda.) Gilbreath said it wasn't his choice to use the word "profiling" (as in Zimmerman profiled Martin,) "confronted" (as in Zimmerman confronted Martin) or to put quotes around "these as*holes" and "f*cking punks" but no other phrases in the affidavit. There's a reference to the final affidavit being the third version, with the first two containing mistakes. It sounds like the affidavit initially written by the investigators was re-written by the prosecutor and they just signed off on the changes. On the use of the word "profiling"
O'MARA: Why did you use the word profiling rather than noticed, observed, saw, or anything besides the very precise word profiled? And by the way, was that your word? GILBREATH: I don't recall. This was a collaborative answer -- excuse me, collaborative document. O'MARA: Between who in addition to the two people who signed it as being true? GILBREATH: Detective Osteen and I prepared the majority of this. It was reviewed by our supervisor. There were several mistakes in it. They were corrected. O'MARA: Do you know whose word profiling was? GILBREATH: No, I do not. O'MARA: Who was in this decision making process? GILBREATH: As I said, Detective Osteen and myself and Bernie. The use of the word "profiling" was either picked by O'Steen or the prosecutor. My money's on de La Rionda. The word "profiling" is not typical cop jargon and is a legal term. O'Mara also asked Gilbreath where the statement in the affidavit "Zimmerman felt Martin didn't belong in the gated community and called the police," came from -- he asked if Zimmerman told him that or if it came from his sworn statements. Gilbreath responded that he has never spoken with Zimmerman and it came from Zimmerman's call to the police dispatcher. But, Zimmerman never used those words during the call to the dispatcher. (Transcript here.) Since he doesn't recall it being in Zimmerman's sworn statements, and he never spoke to Zimmerman himself, (nor apparently did investigator O'Steen or anyone in the state's attorney's office after it got the investigation from the Sanford police) it seems to me those words were chosen by Prosecutor Bernie as well. Moving on to the line in the affidavit stating Zimmerman followed Martin home, falsely assuming he committed a crime: Gilbreath says that wasn't his choice of words either. GILBREATH: It was the three of us throughout the process. I don't recall who did which sentence in this. This was not everybody sitting in one room. This was proof given to somebody else and then prepared. A reasonable but not definitive interpretation of these exchanges is that the investigators submitted a draft of the affidavit to the prosecutor, who said it contained mistakes, crossed things out and inserted and substituted his own words, had it retyped, signed by the two investigators and then submitted to the court. Who chose the word "confronted"? That's not as clear but the upshot is that Gilbreath acknowledges he has no evidence Zimmerman "confronted" Trayvon as opposed to that the two just met up. O'MARA: Zimmerman confronted Martin, those words. Where did you get that from? O'MARA: Which means they met. I'm just curious with the word confronted and what evidence you have to support an affidavit... And I want to know your evidence to support the word confronted if you have any. GILBREATH: Well, it's not that I have one. I probably could have used dirty words. O'MARA: It is antagonistic word, would you agree? GILBREATH: It could be considered that, yes. O'MARA: Come up with words that are not antagonistic, met, came up to, spoke with. GILBREATH: Got in physical confrontation with. O'MARA: But you have nothing to support the confrontation suggestion, do you? GILBREATH: I believe I answered it. I don't know how much more explanation you wish. Added: The CNN transcript says the detective said "dirty words" but others who saw the exchange report he said "thirty words." O'MARA: And you swear this is true. GILBREATH: I don't believe those statements are untrue. Keep in mind this is the same affidavit that got what seems like the judicial equivalent of a rubber-stamp of approval from Judge Mark E. Herr at Zimmerman's first court appearance, minutes after it crossed Judge Herr's bench. The state never asked Trayvon Martin's father to identify the screaming voice on the 911 witness calls as being Trayvon's voice. O'MARA: You're not aware of any inquiries made to Trayvon's dad as to whether or not he could identify that voice as being his son's? GILBREATH: No. The only outside analysis the state relied on to identify the screaming voice was that conducted for the Orlando Sentinel and the FBI. Neither provided insight. O'Mara: Did you do any forensic analysis on that voice tape? O'MARA: Did you or are you aware of anything? GILBREATH: The "Orlando Sentinel" had someone do it and the FBI has had someone do it. O'MARA: Is that part of your investigation? O'MARA: Has that given any insight as to the voice? O'Mara: So do you know who started the fight? O'MARA: Do you have any evidence that supports who may have started the fight? The state has no evidence contradicting that Zimmerman started to walk back to his car after the dispatcher told him he didn't need to follow Martin. De La Rionda tells Gilbreath when its his turn for cross-examination, "Mr. Gilbreath, I didn't know we were going to be trying the case." Again, it sounds like de La Rionda had decided not to press for no bond so as not to have to put on a case. I'm not going to get into every little contradiction but wouldn't you agree that a lot of his statements can be contradicted by the evidence [of other] witnesses or just based on what he says himself? Did he not describe to the police that Mr. Martin had him on the ground and kept bashing his head on the concrete over and over and just physically beating him with his hands? ...Did he also not state that at some point, he the defendant -- did he not state or claim that the victim in this case, Mr. Martin, put both hands one over his mouth and one over his nose so that he couldn't breathe? ...And all of sudden that's when he was able to get free and grab the gun. Or I'm sorry, Martin was grabbing for the gun, did he not claim that too at some point. climb that? So the state will claim that at one time, Zimmerman said when he got free from Martin after having his head bashed on the cement, he reached for his gun. And that on another occasion, Zimmerman said Martin grabbed for the gun. And because these statements are inconsistent, Zimmerman is lying and his self-defense claim is not credible. Only, during de La Rionda's cross-examination of Zimmerman, Zimmerman denied giving inconsistent versions of events to police. De La Rionda couldn't ask him about the specifics of his earlier statements. Zimmerman took the stand only to make a statement of apology directed to the Martins, and not to testify about the crime. Questions about his prior statements to police about the charged crime were outside the scope of his testimony. De La Rionda could only question Zimmerman about matters relevant to his apology. But, I'm wondering whether Zimmerman ever said both of those statements to police, or Zimmerman said one and the other is what a relative or spokesman for Zimmerman represented on TV as being what Zimmerman said to them. If it's the latter, it means little to nothing. De La Rionda kept returning to the theme that there was no evidence Trayvon was breaking into anybody's house or committing any type of crime, and had a perfect right to be walking down the street that night, with his lawfully purchased skittles and iced tea. He ignores the issue of whether Trayvon or Zimmerman turned the encounter into a physical one. He never claims Zimmerman attacked Trayvon or Trayvon didn't attack Zimmerman. Through a series of leading questions, the state's theory becomes even clearer. It's that Zimmerman, by asking Martin a question when they first encountered each other, "confronted" Martin. And sir, you were asked about the next paragraph here that Zimmerman confronted Martin and a struggle ensued and you were asked a lot about what "confronted" means. If Mr. Martin was minding his own business and was going home and somebody comes up to him and starts accusing him (inaudible), wouldn't you consider that a confrontation? DE LA RIONDA: That is, Mr. Martin didn't turn around and start -- he was minding his own business and Mr. Zimmerman's the one that approached Mr. Martin, correct? But that last question was just de La Rionda testifying, not the evidence. Because the state chose not to put on any evidence at the hearing, the question assumed facts not in evidence, was objected to, and the court sustained the objection. So there is still no evidence Zimmerman first approached Martin. More importantly, I think who first approached whom is irrelevant if Trayvon threw the first punch, and Zimmerman sustained a broken nose and the lacerations we saw in the photo released today by ABC News, taken three minutes after the shooting. Whether Trayvon was doing anything wrong before their encounter is not the issue and neither is who spoke to the other first. No one is legally permitted to punch another person because they were asked a question. If Trayvon struck Zimmerman first, the only issue will be whether the attack was severe enough to reasonably cause a person to fear serious bodily injury or death. And even in the unlikely event the Court were to agree with the state that Zimmerman was the aggressor merely for following Trayvon for no good reason, he'd still be entitled to claim self-defense after such an attack by Trayvon, unless he had the opportunity to get away. The state did not even suggest today that Zimmerman had an opportunity to get away from Trayvon. DE LA RIONDA: Why did you use the word "confronted" sir? GILBREATH: Because Zimmerman met with Martin and it was compiling the facts that we had along with the witness statements of the argumentative voices and the authoritative voice being given from one of the witnesses and then the struggle that ensued that came from several witnesses. This is an acknowledgement that no one saw the start of the struggle. Most of the witnesses described what they heard. A few may have seen it in progress. We're back to the "authoritative voice" that was heard, but its speaker not seen. Zimmerman has a low-modulated, almost timid voice. What happens if recordings of Trayvon are introduced and his voice is deep and assertive? Even his phone friend says he demanded Zimmerman tell him why he was following him. If Trayvon's voice turns out to be more authoritative than Zimmerman's, this authoritative voice theory will hurt, not help the state's case. De La Rionda never even insinuates there is evidence Zimmerman started the physical alteration. Why? Most likely, because they have no evidence of it. And, in my view, they probably have evidence it was Martin who started the physical fight. They have at least one witness, John, who told them Zimmerman was the one crying out for help and on the bottom during the struggle. One of the first rules of trial practice is that a lawyer, in creating a theme and a theory for a case, must accept the "facts beyond change." You build your story from that. De La Rionda's strategy and questioning today leads me to believe even more strongly that they won't dispute that Martin was the physical aggressor -- the one who first resorted to violence. Instead, they may tell a story that has Martin being followed for no good reason, and that Zimmerman's verbal demand to know what he was doing in the neighborhood, based on his unjust perception that Martin was a criminal, somehow provoked Martin into hitting him. They will add that Martin was scared, acted impulsively, and didn't hit Zimmerman hard enough to warrant a reasonable fear by Zimmerman of serious bodily injury or death. Trying to cast Zimmerman as a de facto aggressor because Martin shouldn't have been followed in the first place, will not work. For one thing, Zimmerman wasn't breaking the law in following Trayon or even in demanding he account for his presence, if that's what happened. Was it morally objectionable? Yes, but that's why citizens' watch groups and programs encouraging people to report suspicious behavior are a bad idea. "Suspicious" is far too subjective a term. Also, the state doesn't dispute that Zimmerman was on a personal errand that night and not acting in his capacity as watch person. Nor is Zimmerman a law enforcement officer or agent of the state, whose actions are subject to the 4th Amendment. No one is entitled to respond to being followed or verbally confronted with physical force. No matter how much of a saint Martin was before that, if he threw that first punch, I think Zimmerman's only burden is to show some evidence, not a lot, that as a result of the force used against him, he was reasonably in fear of serious bodily injury or death. Even if he is saddled with the extra burden of showing he couldn't get away (which in my view he shouldn't be), his medical records showing a broken nose (which O'Mara offered to produce today) and the photographic evidence of his head injuries taken three minutes after the shooting, should easily suffice to meet it. The state didn't do well today. O'Mara and Zimmerman fared better. I think Zimmerman's 2005 arrest is a dead issue now. The judge, in downplaying its relevance at the bond hearing, is probably going to find it inadmissible at trial. Not only did it not result in a conviction, it was too long ago and dissimilar to the shooting. Ok. And tell me, after you committed this crime and you spoke to the police, did you ever make that statement to the police, sir? That you were sorry for what you've done or their loss? It has not been established that Zimmerman committed any crime. He had the opportunity to prove a crime today and chose not to. Nor has Zimmerman ever admitted committing a crime. While O'Mara didn't object, someone needs to call him out for it. Just to be clear, I have no inside information. I view all cases through the lens of the defense. My conclusions are based on my analysis and assessment of information that has been publicly released by officials and presented in court, my research on Florida law, other documentation such as photographs I believe to be credible, and my instincts and experience as a criminal defense lawyer. Many facts have yet to be revealed, and my opinions are subject to change as new facts develop. For one thing, Zimmerman wasn't breaking the law in following Trayon or even in demanding he account for his presence, if that's what happened. Was it morally objectionable? Yes, but that's why citizens' watch groups and programs encouraging people to report suspicious behavior are a bad idea. "Suspicious" is far too subjective a term. I don't think there's anything "morally objectionable" about people keeping an eye on their neighborhood for any suspicious activity and reporting the same to police - even if those suspicions are subjective. I think it is morally objectionable to follow someone and - while armed with a weapon - start questioning them or demanding they account for their presence (if that's what happened). With the former, it's up to the police to decide if those suspicions warrant further investigation and there's much less risk. With the latter, not so much. All of which, I guess, is neither here nor there, given that the only thing that matters in this context is what is legally objectionable/permissable. From the beginning I have been very skeptical of most of the assertions that Zimmerman broke the law or lacked a valid self-defense claim. Too many of the accusers used trumped up factual allegations, easily debunked, and constructed complex conspiracy theories - all of which seemed to contradict the other. Occam's Razor pretty much dictated belief for me that Zimmerman's version of the events was as close to the truth as we're going to get. That said, with the introduction of the special prosecutor in the case, I have been looking for some reassurances that (a) there is evidence contradicting Zimmerman's version of events, (b) there is evidence to support the charge, and (c) the special prosecutor is following the evidence rather than exploiting the Martin family's grief and disbelief surrounding their son's death. Unfortunately, on the contrary, every single time I see the fruits of the special prosecutor's work, I walk away even more convinced that my initial beliefs are correct and that the Corey team are deploying an extremely cynical and PR-related strategy to cover up the fact that they never should have brought this case to a court. coming to the same conclusion, at least on the legal side. I still think he did horrible things from start to finish, and clearly that kid would be alive today if not for him. I don't know how either set of parents can stand it. the SYG law bears a lot of the responsibility for this. I mean if there was no law then Zimmerman still would have been probably been following Martin but the police would have had to handle the situation. I mean if there was no law then Zimmerman still would have been probably been following Martin and the same things still would have happened. saying that he would have broken the law? he wouldn't have broken the law regardless of SYG. And we don't know for sure whether he had in fact acted in self-defense since we don't have all the evidence. SUO may be saying that the only change would be all the pages and pages and pages and pages of discussion around SYG as a defense. Few if any changes to the events. I don't believe the events of that night would have been any different absent the SYG law. how would the police response had been different? that was the reason that was given for why there was no initial arrest. I was mostly thinking of the events up to and including the shooting. Ironically I think the person who is at the greatest disadvantage from the lack of initial arrest is Zimmerman himself. Since we probably wouldn't all be talking about it right now, had that happened. I do not agree that the absence of the SYG laws = "the police would have had to handle the situation." ...of self-defence. SYG adds the SYG hearing, and the civil immunity, but does the immunity from arrest really add anything -in law- as opposed to making arrest of Z seemingly less politic than before? with rgeard to the prosecutor and his "theory." He had not theory. It was an incompetent and unprepared person who was grasping at air and missing opportunities. To evaluate the States' case based on yesterday can only be based on the incompetence of the prosecutor, not the existence or inexistence of any evidence one way or another. On the testimony of the affidavit from the investigator, I think it is a charade. "Who prepared this affidavit" is always the silly question. That siad, the investigator should have known better. He also seems incompetent. In fact, I have seen little sign of any competence in the Florida law enforcement apparatus. Finally, what is the relevance of Zimmerman being allowed to apologize in a bail hearing? WHY was that allowed? Is any proffer whatsoever required? And if the proffer to the judge was "my cluient wants to apologize," how is gawd's name was the testimony allowed? BTW, I completely disagree with you that the apology did not open the issue of the alleged crime itself. Jeralyn, can you recommend a site that is talking about this from the otehr perspective one of a prosecutor? I appreciate your perspective, but I'd like to hear the other side. toward the charges and the process is quite relevant to the risk-of-flight factor in a bail determination. On this basis, you could say, the apology was relevant to one of the issues on the table at this hearing. But more than that Peter, Zimmerman said more than "I'm sorry," he said he did not know if Martin was armed and he did not know how old he was. IF that was relevant, then the prosecutor gets to cross him on it. I associate myself with the comments of Mitch Guthman on the subject of the missed opportunity by the prosecutor. I think that ideally the prosecutor's objective here is not a "devastating" cross-examination but rather it is to lay the foundation for the cross-examination at trial or perhaps even to keep the defendant off the stand altogether. This was a very rare opportunity that shouldn't have been wasted. I can only really speak from the perspective of a former prosecutor and so my perception of how defendants prepare for trial is probably different from that of a defense lawyer who might find my perspective somewhat insulting. Nevertheless, one of the reasons why prosecutors don't like cross-examining defendants (especially those with clean records) is that by the time they testify at trial the testimony of nearly all criminal defendants will conform remarkably closely to and avoid conflicting with the physical evidence or other highly credible prosecution testimony. Many prosecutors attribute this phenomena to the fact that defendants testify after discovery and after the prosecution has put on its case. Therefore the critical issue for the prosecutor in this type of situation would be to begin the narrow the defendant's opportunity to shape his testimony at trial so that it can accommodate irrefutable prosecution evidence. Here, the prosecutor had the opportunity to take Zimmerman through the night's events step-by-step in a way that would have forced him to either testify truthfully or else take his best guess at how the physical evidence, etc is going to turn out before seeing any of the prosecution's cards. If he says he remembers something vividly, he must continue to remember vividly. If he can't remember something today, it will be much more difficult for him to suddenly claim a memory flash a year later at trial. And so forth. So the goal of the prosecutor (who does have some idea of where the physical evidence and eyewitness testimony is going) is to force the defendant to commit himself irretrievably to a version of events and to do so while blind to the state's evidence. This is a part of doing the ground work for the cross at trial. Hearings like this are sometimes where you get the "good stuff"----you get it the same way a bridge master makes his trumps good. What's more, such an opportunity can payoff in important ways. For example, I think there is a high likelihood that Zimmerman will want or need to testify. The case is completely about him and there's nobody else who can tell his story for him (ironically enough since he's the only one left alive to tell the tale). Plus, of course, we don't know what the physical evidence says and it may also be that the prosecution's case-in-chief is so strong that Zimmerman is practically compelled to testify. (If today is any indication that seems unlikely. But I'm really speaking hypothetically here). And juries always like to hear a defendant testify, no matter what the judge instructs them. There's also the fact that he's got a clean record and seems fairly intelligent and well spoken, all of which makes him difficult to cross. What does this have to do with today's hearing? His testimony today would have been set in stone. If it turns out to be sufficiently inconsistent with, say, the physical evidence he might not realistically be able to get on the stand because he can't maintain his prior testimony (because it's got too many holes in it or whatever) but because he's locked in under oath, he really can't take a different testimonial tack either. In effect, this would be a powerful victory for the prosecution because his early testimony might ultimately have prevented him from personally persuading the jury of his innocence and then, too, juries do tend not to like it when defendants don't testify. My point is that today the prosecution had everything to gain from a good cross-examination and really nothing at all to lose. In my opinion, this was a huge breakdown by the prosecution. I concur in every respect and it's comforting to my own self esteem to know a former prosecutor agrees with me. My comment was limited to the point I identified - your question how the apology was relevant to the bail hearing. I am deliberately not getting into the armchair quarterbacking and the detailed scrutiny of the case. That's not my thing. I'm an appellate guy, not a trial lawyer anyway. Nothing I could add to J's fact-based analysis or to your (and Mitch's, etc.) critique of it. about Martin being dead. I don't say that from a defense or prosecution perspective. Zimmerman's feelings just don't seem to be nobody's business but his own and I especially don't see what they've got to do with the subject of a bail hearing. As I understand it (apart from some uniquely weird Florida issues of proof,etc which Jeralyn has covered), this is just an ordinary bail hearing. The judge can consider dangerousness and whether the defendant is a flight risk. about taking another person's life, even if (hypothetically) in self-defense, is definitely more of a danger to the community than one who is filled with regret and remorse over his own (hypothetically justified) fatal action. And someone who is filled with anger over having been unjustly arrested (hypothetically) is more of a risk of flight than someone who appears to accept that the system will take its course, that it makes sense that a jury should decide whether a dubious and questionable claim of self-defense is valid or not, even if he believes that his (hypothetically) justifiable though deeply regrettable action will eventually be seen as such. To show the potential jury pool that he is not a monster? It worked out well, being that the hearing was on a Friday, because all weekend the news will be "Zimmerman apologizes to Martin family" and most of the legal analysts on the blogd, newspapers, and on TV, are speculating about how weak the prosecution's case could be. Linked yo the wrong comment -sorry. But it certainly plays well to the pitential jury pool and on the other side, Benjamin Crump and Natalie Jackson were also able to give their quotes about "how outrageous" these self serving statements were. and what their thinking might be, I'm reminded of an old Napoleon adage not to ascribe motives where incompetence can explain. in our area, and I can assure you, the police have NEVER encouraged ANYONE to carry a gun. It is totally against the principles and operations of what Neighborhood Watch is about. I distinctly remember one community meeting where a resident said he owned a gun and the police officer present stated unequivocally that people should NOT be going out with weapons. And I, too, am very tired of claims that Watch groups are vigilante groups. I think that's a smear because it could not be further from the truth. Living in an area where home and auto break-ins and burglaries have escalated, I fully understand, support, and have participated in Watch activities. The very idea that residents should just sit back while witnessing crimes in progress is bunk, IMO. The only thing we are ever advised to do is call 911 and make as detailed a report as possible. That's it! 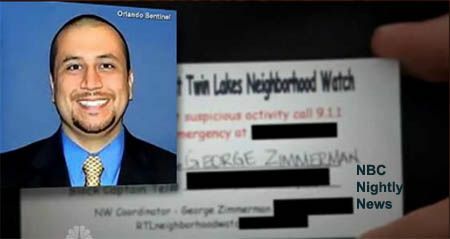 As has been stated ad nauseum, Zimmerman was not part of any official Neighborhood Watch group. From all accounts, he was a self-appointed watchman, and one who made the bad decision to do his "patrols" while carrying a loaded gun. GZ was in any case under no obligation to disarm or not follow anyone he was suspicious of or defer to anyone's "training". NW are not deputized organs of the state and are not subject to any discipline that other citizens are not, that I know of. in terms of the big picture but maybe was less inept in the specific instance of this hearing than I thought yesterday. In reviewing the transcript, I was struck by this exchange between the judge and the prosecutor which I'd missed when watching on the Internet. The judge limits cross, saying: "I think you can classify that whether or not he asked the apology. I don't want to get into other areas". This leads me to suspect that there was some discussion in chambers and that the judge seems to have ruled in chambers that Zimmerman could take the stand for the limited purpose of making his "apology" without being cross-examined about much of anything. I don't know why a prosecutor would go along with it in the first place or why he wouldn't make some kind of an objection in open court about how unfair it is for Zimmerman to just be allowed to take the stand to make a self-serving speech and not be cross-examined about anything else. Neither do I understand why he wouldn't be pushing the limits just to make clear what's really going on and to show prospective jurors that Zimmerman isn't really "testifying" or being honest about his feelings because he won't answer questions about that night under oath. Apparently, however, the prosecution agreed with this act of judicial largesse and I suspect that's why the he didn't try to ask any meaningful questions. Although based his attempts to cross Zimmerman and rehabilitate his investigator, he would have been better off just blowing up the hearing and walking away over the judge's agreement to let Zimmerman use the courtroom as a platform for his media strategy. The prosecution didn't seem well prepared, made no effort to limit the scope of direct of the police officer or limit the scope of direct of the Zimmerman family to limit the propaganda flinging, so overall, the prosecutors and cops still look like a clown show. They lost a lot of ground yesterday. First, it seems to me if such an event took place, then a proffer of the apology would have been offered. I again question the relevance of an apology in and of itself. Peter G., say it goes to "flight risk." I have no idea how it would do so. Why are people who are "sorry" less likely to flee than those who are not? The logic there escapes me. Second, the judge stopped the questioning regarding whether Zimmerman expressed remorse PREVIOUSLY. Nothing was asked or stopped on questions regarding whether Zimmerman knew Martin was armed or how old Martin was. The whole "I did not expect to try the case" comment from the prosecutor was telling. Apparently he was surprised when his investigator was called. The judge has no problem with that apparently. I'm with the comment about the adage of trying to ascribe motives to incompetence. I may be reading too much into that one exchange but, frankly, I'm just at a loss to understand what happened. On the one hand, if it's true that the judge said he would let Zimmerman make a speech and not be cross-examined then the prosecutor didn't throw away what you and I saw as a once in a lifetime opportunity because what we were seeing was only the illusion of an opportunity. On the other hand, even if it's true that the judge tied his hands in chambers, for the prosecutor to willingly participate in such a charade was folly par excellence. This was a televised hearing which nearly every prospective juror was probably watching. He really needed to speak out in open court (and in front of the television cameras) about the unfairness and inappropriateness of allowing Zimmerman to give the false appearance that he was testifying when in reality he was simply holding a judicially sanctioned press conference. He needed to push Zimmerman and force the judge to openly shut down the cross-examination so the audience would understand that the deck was stacked agains the prosecution. As I said, if the judge did rule the way I suspect, the prosecutor should have just walked away from the hearing and held a press conference. To continue to participate was really just to allow Zimmerman a free shot at making a good impression on public opinion. I guess I would just say that the prosecutor didn't exactly cover himself in glory in that courtroom yesterday and leave it at that. prosecutor could have made a record that he objected to Zimmerman's statements w/o jeopardizing the opinion of potential jurors watching the hearing. Yes, he should have objected on the record if the judge had already ruled Zimmerman could testify and cross examination would be limited to whether Zimmerman earlier made identical statements to Sanford P.D. How does a prosecutor object to a criminal defendant's apology to the family of his victim w/o seeming uncaring and callous himself? A defendant has the right to address the court and make a statement at his bail hearing. The prosecutor did in his cross of Zimmerman say his statement wasn't really being made to the court but to the Martin family, but that doesn't give him the right to cross-examine him on matters outside the scope of his apology. [De La Rionda]: And isn't it true that in some of those statements [to police] when you were confronted about your inconsistencies, you started "I don't remember"? O'MARA: Outside the scope of direct examination. I will object your honor. JUDGE LESTER: We'll give you a little bit of leeway. Not a whole lot but a little bit here, ok.
De La Rionda: Isn't it true that when you were questioned about the contradictions in your statements that the police didn't believe it, that you would say "I don't remember"? JUDGE LESTER: I'm going to grant his motion at this time. De La Rionda: Ok. Now, sir, you had a phone at some point and you agreed to turn over that phone to the police so they could make a copy of what was in there, right? De La Rionda: And in that phone did you receive or send text messages sir. De La Rionda: Did you ever make any reference to a reverend? O'MARA: Objection, your honor. Outside the scope. De La Rionda: Did you ever make any reference to Mr. Martin, the father of the victim? JUDGE LESTER: Sustained. You're getting a little bit far away. De La Rionda: I apologize your honor. My question is he was asked in terms of apology to the family and I'd like to be able to address that if I could. It a question of legitimate trial tactics. The prosecutor needed to get his side of the story out to the public and making an objection to letting Zimmerman hold a press conference in the courtroom seems like something he needed to do. The prosecutor needed to let the public know that the judge was not going to force Zimmerman to endure cross-examination and that Zimmerman probably wouldn't have made his speech to the media had he known he'd be forced to answer questions under oath. To my mind, it's no different from making speaking objections. They may be prohibited but I always made them anyway every chance I got and kept right on making them until it looked like I was going to have to spend the night in parish prison. Every halfway decent trial lawyer I've ever known has used speaking objection during a jury trial. Jeralyn, you can't tell me that don't use speaking objections to educate a jury about the law or to make some other important point to them! The way I'd be looking at it if I were the prosecutor, if Zimmerman gets to make a speech about the case to the television audience then I get to make a speech, too. If the judge doesn't like it he can say so, which would be fine with me because the more the judge shuts me down, the clearer my point will be with the jury (or in this case, the potential jurors watching on TV). So, I personally think he should have made the speech anyway and gone right up to the line on cross so that the judge and defense lawyer could help make it clear that Zimmerman's not willing to answer questions under oath. Wanted to meet with the parents alone to apologize and they declined, if I recall. the day before. Trayvon's parents didn't feel this was the appropriate time for an apology. Personally, I think the parents' wishes should have been respected under the circumstances and couldn't help feeling appalled that he went ahead and forced it on them anyway. I don't think it was such a good idea for him to do it. (I'm not an attorney). Except just last week the parents on the Today show said they had three questions for Zimmerman, which is exactly what he answered. "During the interview, Ann Curry asked, "If you were to come face-to-face with George Zimmerman, what do you want to tell him? What do you want to ask him?" Ms. Fulton replied, "I believe it was an accident. I believe that it just got out of control and he couldn't turn the clock back. I would ask him, did he know that was a minor, that that was a teenager, and that he did not have a weapon?" The interview questions were asked because Zimmerman hadn't apologized or shown remorse up to that time. You can see/feel the pain all the time with both of Trayvon's parents that their son is gone. I don't know how anyone could possibly miss seeing how much pain they are in. They've come all this way (since Feb) -- not a word from Zimmerman (at least nothing of the sort reported in the news) -- and now they are preparing themselves, including emotionally, for the legal process, however long or short it turns out to be, not knowing what they'll find out or how it will end, etc. It doesn't seem hard to understand, at least for me it doesn't seem hard to understand, that they would decline such a request at this time. It was this week the request was made -- not last week or the week before or a month ago, but 'this week'. Apparently, instead of a heartfelt apology in private (or whatever was intended on Zimmerman's part) at the right time, it was forced upon them in front of the entire world, whether they liked it or not, in a 'my way or the highway' type fashion, totally by surprise. I can't imagine what they were going through. I think everyone watching was surprised. I was sort of amazed (& also not amazed once I gave it some thought that) Trayvon's parents didn't walk out on it. For me, this incident sort of speaks to the two sides. Legally, I have no idea how it plays out. Because the parents have been at the core of the media circus that has transpired. They have been responsible, or rather irresponsible, in some of their statements. And they have had free reign to do so. And with this they lost center stage. it will always be a tragedy that their son died, regardless if Trayvon was the victim or aggressor. That said, I think they should begin to rebuild their lives, go back to work,, cut lose the attorneys and drop off the speaking circuit. office, not returning your attorney's calls, etc., aren't exactly what I'd categorize as "non-circus" type behavior themselves but for that matter, if he could make those calls, why couldn't he call Trayvon's parents back then too? It's in the CNN transcript. I believe he says he was told not to. I disremember by whom. That the statement he gave exactly matches the questions the parents said they wanted answers to explains a lot. Thanks for pointing that out. Their subseqent complaints are unjustified IMHO. Otoh, thinking TM was just a little younger than himself is a bit of a contradiction vs his description to he dispatcher of TM being a late teen (GZ is 28). But I guess TM could have started appearing older to GM when TM started pounding GZ's head against the pavement. Saw where a New Republic writer thought the admission that GZ didn't know whether TM was armed was a blunder, but I agree with someone else's observation that that evaluation made it seem like the writer hadn't recovered from having -his- head pounded against the pavement. GZ's self defense claim doesn't depend on thinking TM was armed (except, potentially, with GZ's gun), and GZ has never suggested anything of the sort. That incompetence is going to prevent justice. we don't really know what justice looks like yet, now do we? Good thing the railroaders are incompetent. The prosecution is in deep doo doo, I believe. This is the trial (and, first, SYG hearing) judge, right? He didn't -have- to let O'Mara cross on the subject of the affadavit, right? One timeserving clown in a black robe had already signed off on it, this judge could have done the same. If he's what Dersh called a "good" judge ("a good judge will throw this out", referring to the APC) Corey's in trouble. been vacillating on whether there was in chambers or other off record discussion of Zimmerman making a statement or not. I think, on the one hand (like you say) there must have been. On the other hand, Rionda was so completely unprepared on how to deal, I just don't know. Either way though, it is quite clear Judge Lester was going to have none of it in relation to any wide ranging cross. He probably could have, and should have tried to probe the age perception apparent discrepancy and the issue of whether or not he perceived Martin to be armed. But Lester simply was not going to allow much, and I think Zimmerman would have probably evidenced concern about Martin either being armed or going for his weapon, and that could have damaged the state even more. All in all, Rionda is probably lucky he didn't go further, he might have lost the whole damn case at the bail hearing. The prosecution team here clearly has the requisite "skill set" to do just that if left to their own devices. for keeping the reporting as close to known facts as possible and for pointing out the open factual questions and how they relate to issues of guilt or innocence. I'm a corporate lawyer, I don't venture out of my area of experience, but I believe in our Bill of Rights. Your reporting is as careful as I've seen in neither trampling on the rights of defendants nor railing against an evil state. Please keep the reporting coming! From the beginning this story has been about the media, not about a homicide, let alone race. Mediagate would be a better name for it. Now if we could just find one high quality journalism organization that would cover it -- fairly, consistently, thoroughly, dispassionately, objectively. No leaning over backwards. Let the chips fall where they may. We need a new newspaper of record. Maybe a digital publication with some kind of micro-charging subscription service to pay the reporters and editors by the piece. I don't know how to make it work but I would pay good money for real reporting. In terms of who whether Zimmerman "confronted" Trayvon and/or who threw the first punch, I agree that the state's evidence, based upon what is publicly known, would never meet the beyond a reasonable doubt burden to show that Zimmerman confronted him. But I certainly think that the evidence is far stronger that Zimmerman was the aggressor, just not to that standard. That is what I thought before, and what the state appears to be relying on. It is undisputed that two individuals ended up in an altercation. They had never met before, but one followed the other, who at least initially tried to get away from him. The person following the other exhibited clear animus towards someone he had never encountered and knew nothing about, referring to him as a "f**&ing punk" that ws going to "get away". And they eventually encountered each other far from where Zimmerman first observed him or his truck. And we have the girlfriend's testimony. Contrary to that we have Zimmerman's version of events. Physically, it seems highly unlikely that Trayvon jumped him from behind while Z was returning to his truck. ... from behind" is Z's story. Who said that? Isn't "what's your problem?" his story, and "I went for my cellphone and he punched me in the nose" his story? In neither case is TM behind him. And the gf's story is that TM addressed GZ first, right? TM "Why are you following me? ", then "Who are you?" Not inconsistent with: then TM punched GZ in the nose. especially the ones to the CNN transcripts. I noticed something funny: The person who did the transcription must be from the North. He/she wrote "climb" instead of "claim." To many Southerners, the words are pronounced very similarly. The investigators may be incompetent, but this scenario is also possible: Authorities never had enough evidence to convict Z, but the governor decided for political reasons to appoint a new prosecutor and investigators, with the idea that they would charge Z with murder. Maybe that's why the detective who got grilled didn't want to get blamed for lack of evidence or the wording of the affidavit. Although Gov. Rick Scott is a Tea Partier, it makes sense for him to proceed with this case, in hopes that the marches and meetings would stop long before voters could be organized. Any riots or mob violence would make it look like Scott couldn't handle the situation, and it would certainly hurt tourism, which is huge business here in FL, especially in the Orlando area. I assume Scott has little concern for African-American voters. This is not about the Governor and politics but the legal issues in the bail hearing. Also, the transcripts were probably electronically transcribed through a real-time software program. i don't believe the transcript was prepared by a human. Responses to that comment about the Governor, politics and race will be deleted, so please don't respond. are prepared by actual human beings sitting at computer keyboards with earphones and a foot pedal. Martin afraid for his own safety because a person unknown to him was trailing him, was Martin justified in using physical force, but not weapon, against Zimmerman? ... of "preemptive self-defense" recognized in some states in which a person may be entitled to preemptively use force (i.e. "land the first punch") in a situation that has reached a point of no hope for de-escalation or escape. I don't know if it's recognized in Florida, and I'm not saying that's what happened in the Martin/Zimmerman case, but it does raise an interesting issue. Martin was so close to his home at the time of the attack that unless Zimmerman pulled a gun on him he could have easily ran home. ... of the position of Martin/Zimmerman at the time of the confrontation. Martin was in a strange development, at night, with rows of identical condominiums, being followed by a stranger. He could have been disoriented/lost and/or hiding from Zimmerman immediately before the confrontation. There are only three houses in that row, and Brandy Green's is at the south end. Many of the houses are in single rows or E/W rows. The houses in question are the only double N/S row in the immediate area. It's in a unique location, near the only secondary or 'back' entrance to the community. Zimmerman's description of Martin's movements suggests that Martin knew exactly where he was going. No, they don't. Zimmerman described Martin "just walking around looking about", a description that's entirely consistent with trying to locate a house. It was a development filled with rows of identical condominiums at night in the rain, while being followed by a stranger. OTOH, maybe you're right. Maybe if Martin had the same advantage as you - looking at an aerial-view map on a computer screen - he would have been able to distinguish the "unique" condo. When Zimmerman first saw Martin, he located him near the club house. There is no double row of houses in that area, and there is the club house and the pond. The club house is close to the main entrance, while Brandy Green's house is close to the secondary entrance. After Martin noticed Zimmerman and looked back at him, Zimmerman says Martin starting walking deliberately toward Zimmerman's vehicle. This would also be the most direct way for him to return to Brandy Green's house, though of course Zimmerman didn't know that at the time. All of the above is inconsistent with Martin searching for Brandy Green's house in the vicinity of the club house. Martin could just as easily been looking around to get his bearings after entering the development. Because he was looking around after entering the development doesn't mean he knew where her house was. Moreover, the mere fact that he was heading in the right general direction of Brandy Green's house does not mean he knew where the house was. He was walking through a development full of rows of condominiums, where he didn't live, at night, in the rain. It would be quite easy to get lost/disoriented, particularly with the adrenalin involved when fleeing from a stranger following you. It's inconsistent with what I said it was inconsistent with, and what you said that I was responding to. How much time would it take for him to figure out he wasn't going to get home by walking across the pond? We know he wasn't a choir boy, so I'm pretty sure he wasn't Jesus. All he had to do to get home was to keep following Twin Trees Lane, and that's exactly what Zimmerman says he did after he gave up on 'walking around' in the vicinity of the club house. What the he// is that supposed to mean? Are you seriously attacking his character because he was found to have marijuana residue in his bag? I guess, by that standard, we should be expecting some snide comments about George Zimmerman's character from you, shortly, huh? Or is he a "choir boy"? 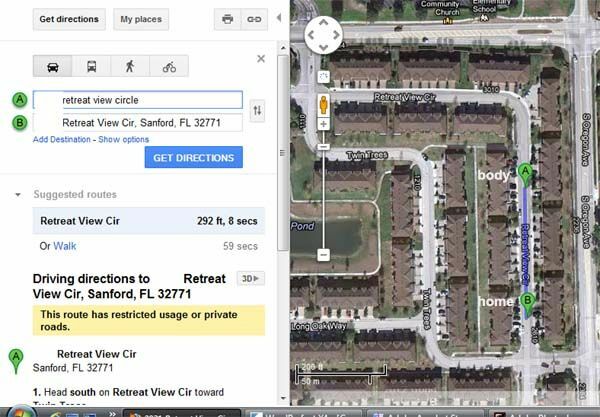 BTW - Zimmerman did not say that Martin stayed on Twin Tree Lane. In fact, he could not have stayed on Twin Tree Lane for very long, given that they ended up on the path between Twin Tree and Retreat View Circle where the confrontation took place. Furthermore, Martin could have gotten close to Brandy Green's home by following Twin Trees Lane, but she doesn't actually live on Twin Trees. He wouldn't have had to perform a miracle by "walking on water", but he would have had to make two turns on Twin Trees, followed by either turning onto the path between Retreat View Circle and Twin Trees (where he was shot) or turning on Retreat View Circle. You were so close - with the benefit of hindsight and an overhead map, of course. Are you seriously attacking his character . . .
No. I was making a joke. I guess I'm not a choir boy either. Zimmerman did not say that Martin stayed on Twin Trees Lane. That's correct. I inferred that when Zimmerman said that Martin was running 'Down toward the other entrance', he meant south on Twin Trees Lane. In fact, he could not have stayed on Twin Tree Lane for very long, given that they ended up on the path between Twin Tree and Retreat View Circle where the confrontation took place. Average walking speed for an adult male is about five feet per second, running speed about twice that. You can confirm that on a number of web sites. Plugging that into the distances indicated on maps of the area, it's clear that assuming Zimmerman simply chased Martin down leaves a lot of time unaccounted for. There was time for both Martin and Zimmerman to walk, let alone any running, to the south end of the double row of houses, then back north to the shooting site, with time to spare. I'm sure that's all it was ... but no follow-up "joke" about Zimmerman not being a "choir boy", as opposed to just the dead teenager? Of course, "down toward the other entrance" could just as easily mean the footpath between Twin Trees and Twin View Circle, or that he continued on Twin Trees briefly and then cut between buildings. Of course, the fact that Zimmerman described Martin as moving "down toward the other entrance" also does not support your original claim that "Zimmerman's description of Martin's movements suggests that Martin knew exactly where he was going." It means only that he was moving in the same general direction as Brandy Green's house, not that he "knew exactly where he was going". BTW - Did you also infer that "all he (Martin) had to do to get home was to keep following Twin Trees Lane"? Because I'm looking at a map of the development, and either that's false, or Martin truly would have had to have been "Jesus". Of course, it's pretty easy for me to get my bearings with some time and the benefit of an aerial map on my computer screen, rather than in the dark and the rain with no map and a stranger following me. Martin could have gotten close to Brandy Green's home by following Twin Trees Lane, but she doesn't actually live on Twin Trees. She does. Her house is on the corner of Retreat View Circle and Twin Trees Lane. Staying on Twin Trees Lane would have taken Martin to her back yard. If Martin did take the northern route, the sidewalk crossing the northern end of the double row of houses, that is still consistent with him knowing where he was going. ...according to your map and its labeling she lives near Twin Trees lane. Perhaps the person on the end condo unit could have some claim to living "on" Twin Trees lane, but even then, that would not be common usage. Staying on Twin Trees Lane would have brought Martin to either a pedestrian pathway to the backyard or to Retreat View Cir, the street Ms. Green actually lived on. Her house is on the corner of Retreat View Circle and Twin Trees Lane. Staying on Twin Trees Lane would have taken Martin to her back yard. Her building is on the corner of Retreat View Circle and Twin Trees Lane - her townhouse is near the corner of Retreat View Circle and Twin Trees Lane. As I said, if Martin had stayed on Twin Trees Lane, he would have had to turn onto either the footpath between Twin Trees and Retreat View Circle (i.e. the common backyard between all the units in these rows), or turn onto Retreat View Circle to get to her home. was unfamiliar with the townhome complex, I wonder how accurate that is. ... because he didn't live there and was just visiting. Literally. Though not still one, at the age of 28. What do you mean "supposedly didn't know what had happened"? You think he might have actually known about it before he called to file the missing person report? I recall seeing Tracy Martin in a TV interview saying the crime scene tape must have been taken down by the time he and his honey got home. That seems to be an admission that they passed that way. I'm puzzled as to how you could have a question about emergency responders being in the complex. Police arrested/detained Zimmerman, put up yellow tape, and processed the scene. EMTs tried to revive Martin, treated Zimmerman's wounds, and took Martin's body away. All of this happened between 1231 Twin Trees Lane and 2821 Retreat View Circle. Twin Trees Lane and Retreat View Circle are inside The Retreat at Twin Lakes community, as you can verify by Googling up a map. Sorry, I misunderstood JBinDC's question. 'Did emergency personnel come in . . .?' looked like a sentence. I didn't notice that 'Which way' had gotten bumped into the title. links and details are in the newer thread. evidence in the prosecution's case, I've seen many people say that Trayvon's girlfriend's testimony will be key. It is my understanding that the Martin's family's lawyers didn't mention her as a key witness until March 20 (3 weeks after the shooting), that she didn't come in contact with the family until a few days before that, that she refused to interview with the Sanford Police Department investigators, and that she did not talk to the state prosecutors until early April. Am I wrong in any of this? Her use as a witness seems to do nothing but to raise more questions. If it is true that she did not contact police, investigators, or the family for 3 weeks after the shooting, and gave nothing on record during those 3 weeks, then I don't see how her testimony will be deemed credible. From what I recall, Trayvon's father found her number on Trayon's phone bill a few weeks after his death and they contacted her. The phone bill the news produced is the one from the family, not the actual cell phone records. According to what I read, her mother said she could be interviewed by Trayvon's lawyers, but no one else. Trayvon's lawyers shared her phone call with an ABC News reporter. At some later time, she was interviewed by the states' attorney's office and they think her testimony is significant. But she did not hear or see any physical confrontation. She says the phone went dead after they each asked the other a question, and she assumed it was because Trayvon had been shoved. That's sheer speculation on her part. I think her lack of knowledge as to what took place after the phone went dead, and all the reasons you list, will make her ultimate testimony of little value. the police would have subpoenaed the phone records and contacted the girl themselves. Unfortunately, her testimony has less weight than it would have if she'd been interviewed by them shortly after the shooting. One question I've had is whether the Sanford police did a full competent investigation. If not, it's hard to make up for that after the fact. Witnesses become less reliable after hearing the news accounts of what happened, and forensic evidence is no longer available. her story, would she be able to change her story and state that she heard the entire fight and still be credible? If you were on the phone with someone, especially someone close to you, and they said they were being followed, and then you heard a scuffle, the phone went dead, and you couldn't get back in touch with them - wouldn't you call someone else to see if they could find out what was going on? I don't know if she did that or not, but wouldn't it seem that she would be scared and talked to someone else? And maybe they were secretly dating. Who knows? And it sounds like her parents perhaps wanted to protect her, maybe they've had bad experiences with the police before, or perhaps they just didn't want to get involved like so many other people when it comes to dealing with these types of situations. If she is subpoenaed to testify we'll find out why because she surely will be asked. even according to Trayvon's family's lawyers, she did not try to come in contact with the police or the family for more than 3 weeks after the incident and according to the phone records they provided, she did not even try calling Trayvon back. She didn't do anything until the family's lawyers came in contact with her and she gave a sworn affadavit 2-3 days after talking with the lawyers. Have anyone but the Marin family lawyers seen this affidavit? I don't see why Crump would want to lock her in at this stage. ...have turned off. I was wondering why it wasn't ringing, but various calls to it reportedly went directly to voicemail. Odd that they wouldn't show on the bill. Odder still that the bill states that all the times are in Pacific Time... The police seem to have taken their own sweet time getting a warrent to turn it on. Want to argue that because a teenager doesn't "think like an adult", that means they're stupid or helpless? Seems to me it would be almost involuntary - you think someone you love is getting hurt and you can't through on the phone. Would you just walk away, shrug your shoukdets and say "Eh"? do not have teenagers. I have a 19 year old and even though he's legally an adult he simply does not have the thinking process of an adult. They just don't have life experiences to make good decisions a lot of the time. I can very well imagine my teenager in this situation. I would never have occurred to him to call anybody. I know grown adults who would act the same. Does that mean ALL adults are like that? I've adked it here before, and not to veer off topic, but why, in criminal cases do many people want to drag the "teenagers shouldn't be held to the same standards as adults" theme out, bug in other cases, say, consent laws regarding abortion, those same people are all for "teenagers should be able to make up their own minds as to the decision of whether or not to keep a baby." I just think it's easier to make excuses when it fits the point of view that one wants to advocate. just that some people don't want to get involved? But now she may have incredible guilt that had she said something before 3 weeks had passed. we are erring on the side of protecting teenagers. Some of us consider the consequences of having an abortion to be less severe than the consequences of having a child as a teenager. However, I would expect her to at least try to call Trayvon back after hearing what she said she heard. You could be right that it would not of occured to her to call anyone. On the other hand, if it is true that she did not make any statement until after the media firestorm and after the family's lawyers got a hold of her (which is my understanding of what the family's account was), then I don't see how her testimony can be that important. And it's not like she heard anything that contradicted Zimmerman's story anyways. She heard a short exchanging of words then a confrontation (both entirely consistent with his account). She said she believed that Zimmerman pushed Trayvon, but only said this after the family's lawyers got to her and after she had been exposed to all of the information (and misinformation) in the media. phone to Martin was initially characterized in the media as his "friend" as opposed to "girlfriend." mentioned nothing about her hearing or saying she heard a scuffle, only the ear piece falling out and the phone going dead. She tried to call him back but there was no answer. I don't remember hearing anything about how she found out he (Trayvon) was in a fight, shot, that he'd died, or when she found out. She may not have known there was anything to call the police about. One could ask however, why didn't the police contact her? I don't know. There is a lot about this case I don't understand. understand why the police didn't use Trayvon's cell phone to help identify him or to use in their investigation. If they had simply looked at the last call dialed or last call received they could have found the girl and immediately asked for an interview. But I guess because they let Z go on the SYG law they chose to not do any follow up investigating. Missed opportunity, as it was with so much of what happened regarding this case. Sanford PD has a lot of explaining to do but I fear it's too late and we will never know exactly what happened that night. Odd that it seems many of the missed opportunities just happen to be on the Martin side too. What a coincidence, huh? The parents weren't afforded the decency of being notified their son was shot to death, can't get hold of some of the witnesses, & what's with the reports of police guiding some of the witnesses' accounts? & no one could be bothered to contact Trayvon's 16 yr old friend with whom he was talking to by cell phone until the call abruptly ended at 7:16,etc.?? It's like "nothing to see here, move along; these aren't the droids you're looking for", or, awww, gee, it's been 3 weeks, your either making things up or you don't count. Really? Now maybe the cell phone was damaged and couldn't be utilized but why couldn't they request the records in a case such as this? I would think it would've been apparent from the presence of a head set Trayvon might well have used it very recently. Then people wonder why others are out protesting, lol. Amazing. I'd be a lot more concerned if people hadn't protested and brought what happened to everyone's attention. Afterall, that's the purpose of a protest, nothing more, nothing less. It is not to subvert justice but to shine a light on it, like it or not. I truly believe Martin's side is ready for justice no matter how it turns out. I'm not so sure about the Zimmerman side however. I really don't believe they are. decency has anything to do with it. See this Reuters interview with Tracy Martin. His father called police early the next morning and by 8 am, they had three cars go to the house, including one with a chaplain. It was about 12 hours after the murder. My understanding was Trayvon had his driver's license on him and is where I was coming from. I can see your point, thanks. as it happened to me when I was 20 - I was on the phone with my boyfriend when he got mugged. A few things - number 1 - you want to hope for the best, and believe that what you heard is not really what you heard. It's amazing what you can talk yourself into when you're worried. Number 2 - who do you call? It's possible that the girl in question did not have a phone number of his parents, even probable, given the age of the two in question and the fact that it's not clear if she was his girlfriend or not. I will say that in my case, I called his friends, that I knew he was out with that night, but they didn't pick up and he was in another city. I didn't really know what to do at that point so I went to sleep terrified and hoped for the best. The next morning his mother called me, hoping I'd heard from him, and I had nothing good to tell her. Which is one of the reasons I didn't call her the night before. If he was okay, I didn't want to scare her for no reason, and if he wasn't okay, I wasn't really emotionally prepared to be the one to tell his mom that - especially since I wasn't actually there, and it was all based on speculation from a phone call. Everyone deals with these situations differently, I wouldn't make too many assumptions about anything based on what his friend did or didn't do afterwards. something. This discussion of the phone call between Martin and the girl who was his friend jogged something in my memory. I believe that certain phones may create hidden files with GPS location and time stamps. This was a big controversy for iPhone owners like me. Do we know what kind of cell phone Martin had and whether it was keeping such a file on his locations? If so, exactly how accurately might it be in pinpointing Martin's location immediately before the line went dead? ...but I am dead serious. The answer is maybe, and anything more definitive than such inference/speculation is a matter of state secrets as it is a compartmentalized SAC program. Seriously. anyone had turned on the locator function also. feet they are. We have them on our phones so that we can see where we all are, and we hope that the app helps if we ever lose a phone. My husband plays with his all the time though to see how accurate it is. It will show that he is at Olive Garden, but not exactly where he is in the building. That is his big challenge for his phone GPS, can it find him down to a square foot or square meter or something that exact. I am skeptical that the girlfriend's testimony didn't come out until after Sanford pd supposedly decline to press charges. Also was her recounting after the family/media had access to 911 tapes and zimmermans statements? her affadavit was obtained in between March 17th and March 20th, which I believe was after the 9/11 tapes, and after Zimmerman's statements were made public. there had to be a confrontation, otherwise, we wouldn't be having this discussion at all, we'd be talking about mitt romney's latest campaign trail gaffe. unless, you're suggesting (and i suppose it's possible, though it would defy the laws of gravity on this planet) mr. martin levitated himself on top of mr. zimmerman, and proceeded to pummel him? mr. o'mara simply lucked out, and caught the cop flustered on the stand, as surely he must know that, indeed, there had to be a "confrontation" between the two at some point. further, aggressive behavior needn't be solely physical. in fact, it rarely is. for the average person, it most likely will be verbal, and that's where mr. zimmerman's question to mr. martin comes in. he didn't simply make friendly inquiries of mr. martin, he presented a demand for information, a demand he had no legal right to make. i suspect a big part of the state's problem at the moment is that not all of the forensic analysis is complete. of course, this makes you wonder why, if that's the situation, they didn't wait until it was, before arresting mr. zimmerman? were i a speculating person, i would speculate that the (as you've previously noted) media coverage had a lot to do with that. That Zimmerman made a demand that he "no legal right to make"? There is no law that says I can't ask a stranger in my neighborhood what his business is. Of course, the stranger is under no legal obligation to answer me, but my actions are not illegal. ...was a confrontation. The question was whether the investigator had any evidence to believe that GZ confronted TM rather than vice versa. The answer was NO. The general rule, however, is that client shouldn't testify about the events at the center of the state's case. Doing so opens the door for the prosecution to ask questions about them, too, Megale said. Zimmerman's case may be the exception -- because his defense will almost certainly be that he acted in self-defense. To make that claim, obviously, Zimmerman has to admit that he killed Martin, so there wasn't much risk of the state capitalizing on his statements at the bail hearing, Megale said. She [Elizabeth Meagle,a former public defender and criminal defense lawyer who now teaches at Barry University's law school] said, "The benefit is he's showing remorse" -- an emotion not wasted on judges. because the incompetent prosecutor did not ask any questions about it. IT was almost all positive for Zimmerman. Andrew McCarthy over at NRO (a former AUSA with the DOJ) takes the prosecution to task for the affadavit leading up to the arrest. He doesn't have anything up yet about the bail hearing, but when he's agreeing with Alan Dershowitz on this case, it seems that the prosecution is definitely in trouble. Cases are not won or lost or even much affected, by the arresting affidavit. Hell, its sparcity is a virtue, less to contradict. It's great for Jeralyn and Co. because they get to say see "no evidence!" But whether there is evidence or not will be seen at the trial, not in the affidavit. Even the bail hearing is really irrelevant, except for the bloviating. My point has been and remains that the prosecutor was handed an opportunity on a silver platter based on Zimmerman's blatant curry for public relations favor (I'm sorry") and blew it. It's a missed opportunity, not damage to the case. The case is what it is. I'mn positive we still have no idea what the State has as evidence. The prosecutor said he was not trying his case there and boy he really didn't. But it is one thing not tor try your case and another to just fumble a big opportunity to buttress your case. IT was an incompetent performance by the prosecutor. If this is what he is, Zimmerman has a great chance of acquittal. If he had a bad day, well he missed a chance, but there will be other days. Cases are won and lost on affidavits every day, whether they be for arrest, search or charging. In this case, the affidavit served the dual service to the causes of arrest and charging. It is an incredibly important document. The first thing any experienced criminal defense3 attorney does is gather, analyze and attack affidavits and warrants. There was a big fat juicy target in this warrant. McCarthy's deconstruction was actually a bit thin if you ask me; here is how I looked at the affidavit: Anatomy Of A Deficient Probable Cause Affidavit. You are nuts if you think A) this affidavit isn't going to get attacked at the Dennis hearing B) that it is not going to get the bejeebies kicked out of it. Remember, the Dennis hearing IS a motion to dismiss factual determination in nature. The nature and sufficiency of the charge will absolutely be a part of that, whether direct or implied. "Sparcity is a virtue"?? Where I come from, sufficiency is a virtue, and this affidavit does not have it. Bail hearing is irrelevant? Again, this is demonstrably wrong. The Arthur process for life cases in Florida makes the bail determination, once invoked, in such cases highly relevant because of the affirmative burden placed on the state. In the instant case, the state either A) knew they could not make the burden of proof and therefore effectively waived any real attempt to do so (I think this is clearly at least partially the case) and/or B) are so incompetent and devoid of substantive evidence to support their contorted theory of prosecution that they were caught on their heels and looked like belligerent bumbling idiots (I think there is likely also a healthy amount of this involved as well). But the hearing has a whole host of very important components, and was extremely valuable. Lastly the statement "I'm positive we still have no idea what the State has as evidence" is also not completely correct. We now know, that the state does NOT have any evidence whatsoever as to who started the actual physical struggle, and that is as close to a ballgame determinative question as there is in this case. The states has squat. And the rest of what they have is effectively junk as per the various holes Jeralyn has ripped into it without even trying. the defendant has the burden of proof, by preponderance of evidence. It is an evidentiary hearing that will be decided based on witness testimony, not submission of affidavits. It will be up to the defense, not the prosecution, to prove what happened in the confrontation. The Dennis hearing will rely on Zimmerman's testimony. In order for Zimmerman to win, his testimony will need to be plausible and consistent with previous statements he has given. (Otherwise the judge will find that he is not credible and deny the immunity claim). As we haven't seen the statements the prosecution has from Zimmerman, we really can't reach any conclusions as to the choices made at the bail hearing. You may have heard those things at the hearing but you didn't "learn them" -- you just chose to believe them. At least one is not accurate, and the others are in a state of dispute. He was not near, let alone "very near" the home he was staying. He was on the path that would have led him to that home. That home was by the back entrance to the community. His body was found near the homes of the witnesses who called 911. The police report puts the body between 2821 Retreat View Circle and 1231 Twin Trees Lane. Here's a map showing the distance between the two (I've blocked out the street number because I don't want to publish the address of the home he was staying at.) The Fox News video of the scene that night shows very clearly where the body is. Witnesses John, Mary/Selma, and the 13 year old all say the struggle and gunshot was outside their homes, which are all where the body was found. While there is no one who saw the onset of the struggle, there is a witness, John, who says he was outside and saw them struggling at a point when the guy in the red jacket (Zimmerman) was on the bottom crying out to him for help. He says he ran inside to call 911, which he did, you can listen to the call, the gunshot went off before he connected. "I think the guy's already dead." So there is a witness who saw the fight and says Zimmerman cried out to him for help and was on the bottom, which supports that Martin had provoked the use of force by Zimmerman (If John is correct, then the question will be whether the provocation by Martin was severe enough to warrant fear of serious bodily injury or death. ) But there is a witness who says he saw Zimmerman being attacked by Martin and thus supports his claim (since the witness didn't see Zimmerman attack Martin.) Other witnesses are now providing different accounts than the ones they provided that night, which makes them suspect, but even if believed, it just puts the evidence in conflict, it doesn't mean there is no support for Zimmerman's version. Zimmerman denied on the witness stand he gave inconsistent versions, so you didn't "learn" that there were inconsistencies. You heard conflicting evidence about it. Said so many times. But I do have a brain. Your comment does not convince me that affidavits matter much at all. I am a civil litigator. I am now in the process of preparing for a jury trial on an antitrust claim against multiple defendants. In preparation for trial, a 247 page pretrial report has been submitted. It lists all the witnesses and all the evidence to be submitted. The expected testimony of each witness is described in detail. The basis for admissibility of the testimony is also described. The legal theories of the parties are fully described. Motions in limine have been filed and opposed. We await the judge's rulings. If we go to trial (settlements are not only common, they happen most of the time), a jury is selected. I'll present my case in chief. I assume the defendants will file a Rule 50 motion. I'll oppose. Assuming the judge denies the motion or holds it in abeyance, the defendants will present their case. I will rebut. They will rebut my rebuttal. We will fight over jury instructions. If we win, the Rule 50 motions will be renewed. No, the affidavits won't be important in my case. You argue they will be important in the Zimmerman case because of the bail hearing. I grant you they were deemed relevant in that hearing and bail was set at $150,000. What's your take on that? How did the affidavit effect that detemrination? You argue that "the Dennis hearing IS a motion to dismiss factual determination in nature. The nature and sufficiency of the charge will absolutely be a part of that, whether direct or implied. "Sparcity is a virtue"?? Where I come from, sufficiency is a virtue, and this affidavit does not have it." Perhaps I misunderstand, but if that hearing will be a challenge to the charge, are you saying the ONLY evidence the State can present is the affidavit? Well, then the affidavit is EVERYTHING. It's not just relevant, it is the whole case. I can not imagine that can be true. But I am not a criminal lawyer. IF the State is precluded from presenting any evidence OTHER THAN the affidavit, then I am so wrong it is not funny. But if the State can present any and all evidence it chooses at such a hearing, then I am right, the affidavit is irrelevant. So answer my question, what evidence can the State present at such a dismissal hearing? Just the affidavit? Or ant and all admissible evidence it has? I'm betting the answer is B. Thus, my brain tells me the affidavit is irrelevant. Whether I practice criminal law or not. I spent nearly 15 years litigating and/or trying Section 1983 cases in additional to criminal defense (mostly illegally coerced confession/torture/malicious prosecution based); I can grasp where you are. Sounds like you have a fun case actually, and I wish you the absolute best of luck in prosecuting it (although I have always found the immunity problems you complain of by way of Twombly/Iqbal to have been the case, they are just more openly and notoriously done by the federal bench now). That aside, what I refer to as a Dennis hearing (SYG Immunity hrg, whatever the nomenclature) is indeed a full on evidentiary hearing. And there is not question but that more evidence, and whatever the state can muster, will probably be in play. Full cross as to that will also apparently be in play. But, there will be two issues, just as I stated above, if O'Mara defends as I fully expect him to. There will be the SYG portion under FLRS 776.032 and there will also be a concurrent motion to dismiss under FLCRP 3.190(c)(4) for insufficiency to establish the criminal charge - in this case the sole charge of second degree depraved homicide. And the Arthur hearing you seem to so disparage lent boatloads of tell tale facts in that regard. Namely, that the ONLY person with a credible version of who started the physical confrontation is Zimmerman, that there is no controverting evidence in the possession of the state (and if the state magically finds it after the bail hearing, they are gonna have some splaining to do), and that Zimmerman's injuries were not inconsistent with his story (even if there may be alternate, unsupported, interpretations). Please, I urge you, read the FL 2nd degree statutes, as charged in this case, under FLRS 782.04(2), 775.087(1) and 775.087(2) and tell me exactly how there is ANT reasonable belief, much less a prima facie case, under the required elements given the devastating admissions by lead investigator Gilbreath at the Arthur hearing. I sincerely do not see how the state can even make the charge, much less overcome Zimmerman's SYG/Dennis assertion. ...and I would never want to be, I would think Zimmerman's call to the police is a version at odds with SYG. Zimmerman states clearly that he has prejudged Trayvon Martin and the situation, and that he, Zimmerman, intends to act on that prejudice right or wrong. He is negligent and careless disregard declaring itself -- a person announcing to the world that their prejudices are soon to be DIRECTING their actions, instructions from authorities NOT to be damned. And to me, the recent rash of burglaries in the complex can work against Zimmerman since, come on, these were all PROPERTY crimes. Now I've lived in neighborhoods most people wouldn't drive through much less live in, I've had people shot to death on the sidewalk outside my bedroom window, I've had my pitbull mix confront and corner a burglar in our back yard, and believe me when I say you do not know anxiety until you have lived in the hood where a police helicopter is literally hovering over your street all night, and for months on end if it's hot enough...so I know what it is to live in a scary situation. Property isn't worth taking a life or losing your own over, no matter what. Would seem to me, the idiot layman, very hard to square a clear SYG claim with what seems to me the addled and prejudiced hero-fantasy sort of stuff Zimmerman clearly exhibits. But maybe it doesn't matter. The law can baffle as much as it can soothe. Or maybe BTD is right as incompetence is all this prosecution team has to offer. Defense lawyers, on the whole, are the more imaginative and creative lot to start with, so I'm never really surprised by prosecutorial idiocy. And at trial, I know the affidavit is not the only evidence the State can present. So if the case goes to trial, and I do not imagine even you think it will not (the politics makes it a certainty imo, and for those of you who believe my description of what I think will happen is an endorsement of that, no it is not), then the affidavits will be irrelevant except as impeachment material. In such case, SPARCITY is indeed a virtue. I know in the civil setting, I would be please not to have to explain away statements from my witnesses. paving the road to hell with that "sparcity is a virtue" argument. Viewed from the due process point of view its a train wreak. If you spent about 15 minutes of at the Innocence Project you'd find the handiwork of that thought process in action. It calls out for incorporation of the grand jury clause which should be the first check on an arrant prosecutor and the removal of the judge made immunity rule for prosecutors. Mine is not a normative comment. But a descriptive one. There are a lot of rules, procedural and substantive, that I strongly disagree with. In my world, Twombly and Iqbal are travesties. But I have to tailor my lawyering to them. "Jeralyn and Co" made pretty specific complaints as to the lack of ethics of the prosecutor. It is my understanding that the only checks left are the state bar (ethics) or the voters. It's pretty clear that many voters see lack of ethics as a virtue. the hearing seemed to agree with your assessment. of which you approve for defining the behaviors that ought occasion a call to police, surely you are not going to offer no alternative semantics. The result, then, is implicitly suggesting that citizens ought never report anything to police. Therefore, the need is to offer your semantic alternative to define behavior that ought be reported to police. That is, with no "weapon" other than a telephone, of course, and with no foolish following or even conversing (as we don't know that there was "confronting") with people that one deems potentially troublesome. I'm not a lawyer, so this is probably a naive question. When Zimmerman took the stand yesterday, was there no concern that his testimony could be used later to argue for limiting his fifth amendment rights? raise self-defense, he will take the stand. I don't think his lawyer was concerned about that. Selective invocation of the 5th Amendment is pretty complicated. It's like walking through a mine field. For an example of a case in which it was attempted, and backfired, revisit Patty Hearst, who was represented by F. Lee Bailey. It didn't go well. The 9th Circuit opinion is here. attorney/client privilege by testifying his attorney told him not to contact the Martin family to apologize directly. who never met him personally and said he hadn't discussed the facts of the case with Zimmerman. It is not an issue. ...that the cops also told him that. On March 20, a Miami-Dade judge cited the "stand your ground" law in dismissing the case against Garcia. The judge said when Roteta swung a 4- to 6-pound bag of stolen car radios at Garcia just before the stabbing, it amounted to a lethal threat. How Martin was approached and if there's any indication of it in the investigatiion by the police would seem relevant. Was Z's gun visible? Is it reasonable to expect a teenager who may not be familiar w/the law to know a stranger approaching him w/a gun is not a lethal threat? Of course the same thing (lethal threat) may be said about Martin. What's interesting to note when reviewing the cases available at the above link, the common theme seems to be, he who initiates the confrontation or does the questionable thing is the one that takes the loss. Wonder how that will play out here w/the prior statements by Z, i.e. "these a$$holes..."
A gun in a holster is not a lethal threat. If it were you would be justified in using lethal force on any police officer the walked in your direction. I would consider it very threatening if I was followed and approached by a strange man after dark. If I could see that he had a gun in a holster or waistband, I would be doubly scared. I would consider it to be very appropriate to use non-lethal force (pushing, kicking, punching) to defend myself and try to get away from the situation. he only had to use force that put Zimmerman in fear of serious bodily injury or death. on concrete can be pretty lethal. It's doesn't take a heck of a lot to kill someone that way. On the other hand most gun shot wounds are non lethal. It's very rare that a single shot would kill someone. Both types of weapons may kill with a single blow or it may take multiple blows. It's kind of a random proposition. Zimmerman could have died from the first blow and Trayvon might be telling us today that Zimmerman came after him with a gun drawn and he had to defend himself. And given the evidence I would side with Trayvon. be lethal than human hands? of San Fransisco a few years back. Just some kids having fun attacking up random people. One blow and the man was dead. Head wounds can a be a nasty thing. ... were killed with firearms that year? you would not be defending yourself, you would be the aggressor, the one who provoked the use of force. If the person following you had not responded to your use of force with deadly force, you most likely would have been charged with assault. You can't respond with violence to your fear from being followed. There is no evidence as yet (as opposed to conflicting unofficial reports) as to whether Martin saw the gun. a knife in some one's hand is more dangerous than a gun. held back presenting evidence out of fear that disclosing it now would aid Zimmerman in shaping his story. Isn't their only hope to try to impeach Zimmerman's credibility by poking holes in his story with hard evidence like forensics, ballistics, etc. The sooner that is revealed, the less likely Zimmerman would be to give an account that might in someway be easily contradicted. When are they required to provide their evidence for the purposes of discovery, and will they be able to use any possible inconsistencies in Zimmerman's statements before and after the discovery to try and impeach his credibility? It seems pretty obvious to me that the prosecution is going to claim at trial that Zimmerman attempted to apprehend Martin that night, and thus that he was the one who initiated the physical altercation. On the call Zimmerman was clearly very upset at what he believed Martin was doing, he said these "assholes always get away", and he requested that the police call him when they arrived rather than meet them at a specific location. All of this would seem to point to someone who intended to apprehend the suspect in question, not risk letting them get away. I find it hard to believe that a jury which listens to the 911 call will find it believable that Zimmerman would have allowed Martin to run off once confronted, rather than try to stop him from fleeing. The only evidence to support Zimmerman's story is his word, and while his theory in the abstract may seem plausible; it does not seem to match up at all with Zimmerman's statements and general attitude during the 911 call. Zimmerman was already enraged by Martin's merely being there, if he tried to apprehend him and Martin struck back it would have only enraged him more. It would seem to me there would be no way to determine which of these scenarios was actually what happened considering only one side of the story can be told. That may very well mean Zimmerman's guilt can't be proved beyond a reasonable doubt, but that does not mean there is no evidence to suggest that Zimmerman is guilty. There is plenty to suggest it, just probably not enough unless ballistics contradict Zimmerman's account of what happened, or it can be proved that it was Martin yelling on the other 911 call which would seem to me to prove definitely that at the moment Zimmerman pulled the trigger he could not have been reasonably in fear for his life. If the prosecution has some sort of evidence to that effect, would they be able to not have divulged it to the defense yet? yet? Should have at least provided the Sanford P.D. reports. The state has 15 days from the defense filing of "Notice of Discovery", which only occurs after formal charging. In short, their time is not up yet to disclose. The Discovery Rule, 3.220, recites "Notice of Discovery. After the filing of the charging document, a defendant may elect to participate in the discovery process provided by these rules, including the taking of discovery depositions, by filing with the court and serving on the prosecuting attorney a "Notice of Discovery"
The Docket indicates that the information, which I believe is a charging document, was filed on April 11. Zimmerman made a non-emergency police call, not a 911 call. Listen to the dispatcher answer the phone. The HOA actually sent out a letter informing residents that Z was the 'go to guy' within their community for 'watch' type situations. It was not a formal NW program, and no one said anything about carrying a gun - but saying he was 'some guy' that was 'self-appointed' seems like an attempt to smear Z. Take the gun from this situation, and the kid is alive - although Z would probably have a good assault case (assuming he really didn't die from having his head bashed in). a copy of his watch card. This topic has been discussed over and over on other threads. Please return to them if you want to keep discussing it and make your comments here relevant to the bond hearing. I'm not going to let the thread get hijacked. I wanted to say I am sorry for the loss of your son. I did not know how old he was. I thought he was a little bit younger than I am, and I didn't know if he was armed or not. In his 911 call, he identfied him as a teenager. 911 dispatcher: How old would you say he is? Not sure how significant that inconsistency is, other than to impeach his testimony generally. Your definition of "a little bit younger than me." To people in their late 20s, teenagers are more than "a few years younger". he is apologetic he thought Martin was older than Martin in fact was. Seems inconsistent to me. he was in his teens from his vantage point in the car when he reported him, but changed his mind and thought he was older when they encountered each other at close range, saw how tall he was, heard him speak, or any other number of factors. There is no inconsistency at all. It is an absolute truth that Zimmerman did not know Martin's age, regardless of how many times he estimated it. No one is suggesting that Zimmerman saw Martin's birth certificate before the incident, long-form or otherwise. That being said, when he apologized, he claimed he thought he "didn't know" Martin's age but thought he was a "few years" younger than himself, as opposed to what he said on the 911 call. So there were inconsistencies between estimates. That just goes to show he did not know his age. "I thought he was a bit younger than I am." ... define "a little bit younger" as (at most) 2/3 of your age, versus a "little bit younger". Might work if he was 6 ... or in absolute terms (at least 9 years), if he was 80. Zimmerman really did need the gun for self defense? Then it was not the problem at all, it was the solution. Are you being paid by the NRA? an elderly black man in Chicago protesting the gun laws in IL. said he wanted to be able to have a gun in the house and carry it with him because he and his peers were sick of being sitting targets for the young thugs who were constantly breaking in to their homes, robbing them and generally threatening their lives and well being. He was a life long democrat. But he disagreed with the democratic party line on this issue. Go fight with him and accuse him of being a mouth piece of the NRA next time your knee jerks in that manner. Yes, he was the person who changed my life long thinking on the gun law issue. So maybe the problem was not the gun. Maybe the gun was incidental to the real problem. Neither of us knows, but we will as the trial goes on, if it goes on. where do you get that number? You think 99 percent of people who carry guns have no experience or training, that is a rather high number. Neither one of our numbers is correct, but I am guessing mine is closer to the truth. Most people don't want to kill themselves or some one else due to ignorance. I doubt that any state requires CW permit holders to be POST qualified or to re-qualify regularly. My impression is that Zimmerman did not have to qualify to get his carry permit. And he didn't even have to have the same level of training as a rent-a-cop to be allowed to carry a gun on "patrol". I have no idea of what number of the civilians who have carry permits have training of any sort but it does seem to me that POST is what ought to be required of anybody who carries a gun and you ought to have to go to the range regularly and re-qualify at least semi-annualy. Bill Cosby is right. The problem here isn't Zimmerman, it's Zimmerman's gun. "The state never asked Trayvon Martin's father to identify the screaming voice on the 911 witness calls as being Trayvon's voice. O'MARA: You're not aware of any inquiries made to Trayvon's dad as to whether or not he could identify that voice as being his son's? GILBREATH: No." Isnt it odd that state hasn't done any analysis itself? It's not odd, though the media would have you think so. I'm about to go to bed, so apologies for not providing links. Basically, established technologies for matching voices require at least ten words. There are new methods that purport to match with a single word or a wordless scream, but they don't have much of a track record and are unlikely to be admitted into evidence. Come to think of it, I believe Jeralyn did a post on this not long ago. Jeralyn's post on a voice biometrics conference. Another theory would be that Martin was afraid Zimmerman would follow him home and know where he lived, just as Zimmerman feared to state his address aloud. He would have gone off in some random direction, trying to make sure he had 'lost' Zimmerman before going home. This theory could account for the two coming together anywhere after any amount of time. It could be that Martin just didn't bother to mention to Dee Dee his decision not to go straight home. She wasn't familiar with the area and likely had no idea how far from home he was anyway. When I started working on timelines, it quickly became clear that there was a lot of time for relatively little space. I think Zimmerman chased Martin south on Twin Trees Lane. After he stopped and caught his breath, Zimmerman and Martin could both have reached the shooting site at a walk with time to spare. Still not following you. After Zimmerman stopped and caught his breath, wouldn't Martin have been able to get home? At what point would Z have been able to catch up with him? Sure. He would have been lost to Zimmerman's sight behind the house opposite his home. He was just steps away from his backyard. I think you may be confused because I've been discussing alternate theories. But I think what I have said is clear if you read it carefully. It's perfectly clear that Martin had plenty of time to get home if he chose too. The question is why he didn't. If Zimmerman was trying to re-acquire Martin, he probably would have been walking in some kind of search pattern. If Martin was trying to make sure he had eluded Zimmerman, so he could enter his house without being seen, he might be walking about the houses randomly. They would be playing hide-and-seek. Martin lost. ... and then shot/killed is hardly a game of "hide-and-seek" to be won or lost. It appears from the hearing that Martin's body was found very close to the back door of the home where he was staying. I can't conceive of any possible situation where Martin "turns around and seeks out" Zimmerman, and ends up being shot in what is essentially his own back yard. I can see a possibility that Zimmerman, looking for Martin, manages to unwittingly end up at Martin's house-- bu to me that would heighten the level of fear that Martin would feel. Also, as Martin was a guest, it's unlikely that he had a key to the house. If there is a high level of burglary in the neighborhood, it is equally likely that the doors to the house are kept locked. Martin may have known that he would have to knock on the door and wait for his younger brother to open to the door in order to gain access. Martin may have essentially run as far as he could and have felt cornered. "very close to the door" mean? It's been reported that his body was found something like 70 yards from the door. That's "very close" compared to a mile, but not what most of us would consider "very close." Expy, this is the second time you have written this as fact and it's not true, as I explained here and others are pointing out. Please state your opinions as opinions, not fact so no one gets misled. So is your assumption that after Martin ran and Z lost sight of him , Z was then able to catch up with him.? z continues on the phone with the dispatcher for almost 2 minutes and isn't panting and doesn't sound as if he is in pursuit. Compared to early on in the call when you can hear the wind blowing, panting and tell he is running. That implies Trayvon had a 2 minute head start on AND he was already pretty close to home when z got out of the vehicle, so I jus don't see it. Unless Martin was hiding out of fear, but he didn't indicate that to his girlfriend. Martin's body was found between the two northernmost houses in the double row of six, 1231 Twin Trees Lane and 2821 Retreat View Circle. 1231 Twin Trees Lane is the home of 'John', the witness who gave local TV an interview from behind his door the day after the shooting. 2821 Retreat View Circle is the home of the second person to call 911, and the address to which the first police officer on the scene responded. There is only one male 911 caller other than Austin Brown, the teenage dog-walker, and his call is consistent with the interview of 'John.' It's the second tape at Huffington Post. The call from 2821 Retreat View Circle is the fourth tape at Huffington Post. It is one of two calls begun before the gunshot, but redaction of private information makes the gunshot inaudible. Two other callers also felt that it all happened in their backyards. The above two are the only ones I have located with confidence. Brandy Green's house is the southernmost of the three houses on the eastern, Retreat View Circle side. Chad probably had the TV loud, watching the basketball game. I think the opposite house on Twin Trees Lane would be that of Austin Brown. His sister told 911 she heard 'something', and then her brother came in telling her of screams and a gunshot. that "he felt invulnerable because he was carrying a gun"? Shouldn't you at least say IMO after such a statement? You're right. I should have qualified my statements as opinion. Nevertheless, I continue to stand by them. In my opinion and all legalities aside, I think Zimmerman acted very foolishly. He was alone but he knew that backup units were on the way. He had no way of knowing if Martin was armed. He had no reason to believe that a violent crime was in progress or that Martin was fleeing after having committed a crime of violence. Even if you accept as true everything that Zimmerman has supposedly said or has ever been said on his behalf the fact remains that one way or another he let Martin get way too close (as events prove). There was no urgency in confronting Martin and there was no need to do anything except go to the mailboxes and turn the situation over to the police. Looking at what seems to be the defense story (and taking it at face value) everything that Zimmerman did suggests that he believed he was not in any danger because he was armed and that he wasn't well trained, either. At some point, he either lost Martin and went back to his truck where Martin snuck up on him, jumped him and tried to grab his holstered weapon or, alternatively, something else happened (and it's pointless even to speculate at this point about what). In any case, if you believe Zimmerman, he was standing next to his truck but somehow allowed a potentially armed and dangerous suspect to sneak up on him and wrestle him to the ground and possibly gain control over his holstered weapon. I don't think the question is what Zimmerman did wrong---tell me one single thing he did right except for calling the police in the first place. It remains my opinion that if Zimmerman hadn't been all tooled-up like a gunslinger in Dodge City on a Saturday night, the Martin kid would still be very much alive and Zimmerman would not be in this jam. considered doing the right thing. We're supposed to call the police every time a teenage stranger (wearing a hoodie, no less) is simply walking along the street? for presenting the commenter's opinion as fact and for name-calling/insults to Zimmerman. Since he's acknowledged this in his next comment, his opinion (which I disagree with) is still presented. not even going to read the 2nd. Excellent reprise of the events. I think that you have hit the nail on the heard here. Listen - having been on the receiving end of an Arrest Warrant Affidavit with lots of "concocted" facts, I have lots of questions about police, investigators, and prosecutors as to whether they can present a fair account of any thing. It is commonplace now for cops to twist the truth and lie simply to get an arrest. See my comments here. (and over time my story). As I understand it, O'Mara can move for immunity from trial hearing under Florida's self defense law. If at that hearing O'Mara can prove by a preponderance of the evidence that Zimmerman shot Trayvon in a reasonable belief that he faced grave risk of serious bodily harm or death if he didn't so act in self defense, then Zimmerman gets immunity from trial, as I understand it and the prosecution is throw out. Would you agree that should be the result? Given political pressures will it be? The state's investigator testified they found evidence that contradicts Zimmerman's version of events. We don't yet know what that is. here, with links to the statutes and case law. The stand your ground hearing is an immunity hearing. If he prevails, the prosecution cannot continue. It's ruled on by the judge and Zimmerman's burden is preponderance of the evidence. Self-defense is an affirmative defense raised at trial. If the judge doesn't grant his immunity motion, he goes to trial where he can still raise self-defense. And the fact that the judge previously denied his immunity motion can't be used to prevent him from raising self-defense at trial.